So, another year is over and we are all a little wiser, definitely older, and maybe even a little bit grumpier. I’m not going to bore you with what has happened with link building over the last year – you’ll have read about it elsewhere (Penguin this, tanked networks that). Here’s a collection of over one hundred blog posts about link building that are slightly above average 😉 Some are for beginners and some are more advanced – there has been no discrimination. I have categorised them to make life a little easier when you’re browsing – don’t complain if you think they are in the wrong place. My decision is final. Also, you will notice that I have added some pretty graphs. They don’t mean much, they don’t prove anything, they are not scientific. They just break up what is essentially a big ol’ list of links – ‘cos that is what this is. Grab a cold beverage and enjoy! *Please note that this doesn’t prove anything. It is merely a title for a post. Which Author Got The Most Links? Which Authors Appear Most Often? Which Post Was The Most Greatest At Performing On The Twitter? Which Was The Bestest At Getting Google +1s? Who Won The Facebook Share War? Which Domains Appear The Most? There you go. 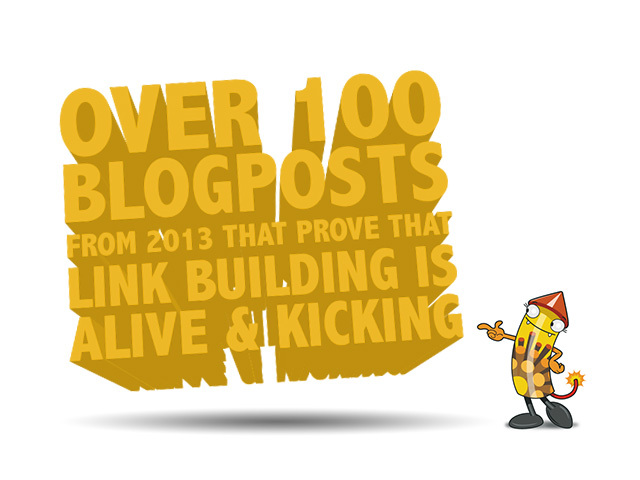 Link building isn’t dead. Hopefully this post will help you discover some gems that may have passed you by throughout the year. If you think that you have some articles that are worthy of inclusion, let me know in the comments and if they pass the very strict Wayne test I will add them. Hey Wayne, Thanks for sharing this post, I completely agree with your post, and I really like it.It’s true link building is not dead.